What Will You Miss Out On by Overlooking Workiva (WK) Stock? 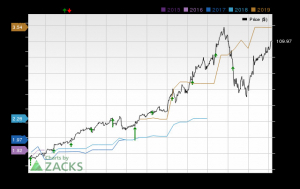 Workiva Inc. WK has exhibited impressive price performance over the last two years. The stock, which was valued at approximately $16.7 at the beginning of 2016, now trades close to $33, reflecting more than two-fold jump. 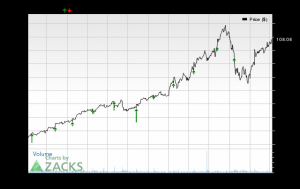 Notably, shares of Workiva have returned approximately 67.1% year to date, compared with the industry’s rally of 40.4%. In the same period, the stock has outperformed S&P 500 index’s rise of 18%. The outperformance can primarily be attributed to the company’s continuous focus on developing its flagship product, Wdesk cloud platform, which is used for collecting, integrating, managing and analyzing business data. Notably, the platform continues to gain traction. We note that Workiva recorded a positive earnings surprise of 34.2% in the trailing four quarters. Let’s delve deeper and analyze the factors driving Workiva’s robust quarterly performances. The company recently strengthened its flagship product, Wdesk platform by adding data preparation capabilities via Wdata. Notably, Wdata merges the company’s existing APIs and connectors with the newly added data preparation capabilities. This process will aid the customers in enhancing, linking and capturing, large datasets to Workiva’s Wdesk platform. In the recent past, Workiva partnered with Host Analytics, a cloud based provider of enterprise performance management (EPM) solutions. The companies together launched an API which realigns financial reporting processes. The customers will be able to import financial data from Host Analytics into Wdesk. Workiva also entered into an original equipment manufacturer (“OEM”) agreement with enterprise-application software provider, SAP SE (SAP). Per the agreement, Wdesk platform will be incorporated with SAP Cloud Platform Integration. The “bundled” or comprehensive combined solutions will aid customers with auditability, control and linking features. The company also integrated Wdesk platform with Anaplan’s Connected Planning platform to streamline the process of performance management reporting. Partnerships like Anaplan will aid Workiva capitalize on growth opportunities that the rapidly-growing Software-as-a-Service (SaaS) market presents. Further, Workiva continues to expand existing customer base with its accounting, SOX and compliance software. This expansion in clientele along with a widening partner ecosystem is expected to drive growth. Furthermore, according to Gartner, the global SaaS market is anticipated to increase at a CAGR of 18.1% from $60.2 billion in 2017 to reach $117.1 billion in 2021. We believe Workiva is well poised to capitalize on growth opportunities of its domain. The Financial revealed that as per a recent Market Insights Report, the global financial services application market will be worth $117.1 billion by 2023 from $74.35 billion as of 2017. Notably, the market is currently growing at a CAGR of 7.86% and the time period under consideration is 2018-2023. We believe that since Workiva’s platform is mostly used for auditing and accounting, the company will benefit from growth of the relevant market. Workiva reported second-quarter loss of 12 cents per share narrower than the Zacks Consensus Estimate of a loss of 24 cents. The figure was also lower than the year-ago quarter’s loss of 14 cents per share. The company posted revenues of $59.13 million during the last-reported quarter, surpassing the Zacks Consensus Estimate by 5.43%. Revenues also exceeded year-ago quarter’s figure of $49.39 million. Over the last 30 days, six estimates were revised upward for fiscal 2018 against none downwards, driving the Zacks Consensus Estimate to a loss of 54 cents from a loss of 73 cents per share. The figure reflects year-over-year growth of 10%. Workiva carries a Zacks Rank #2 (Buy). 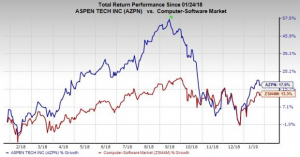 Paycom Software, Inc. PAYC, Aspen Technology, Inc. AZPN and Logitech International S.A. LOGI, in the broader technology sector are worth considering. All the three sport a Zacks Rank #1 (Strong Buy). 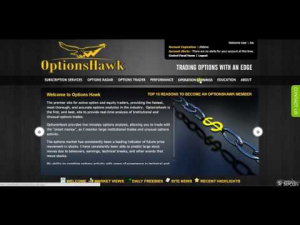 You can see the complete list of today’s Zacks #1 Rank stocks here. Long-term earnings growth rate for Paycom, AspenTech and Logitech are currently pegged at 24.8%, 16.5% and 8%, respectively.